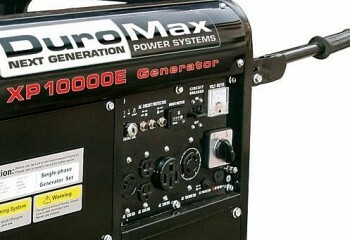 The DuroMax XP10000E 10,000 watt portable generator can be used on a number of occasions, not only as emergency power backup. It serves well to supply power to drills, saws, and other equipment at the work site. The XP10000E is enclosed in a frame made of thick steel and this frame well protects the generator. The vibrations are lessened with the vibration dampening mounts for the motor. The DuroMax 16 HP overhead valve engine is designed to produce 8000 W and 10000 surge watts. It can either be cranked or turned with a key to start. Fitted with an 8.3 gallon gas tank, that is EPA and CARB approved, this can run for about 10 hours on half the load. The exhaust design and the vibration dampening of the frame cause a noise of about 72 decibels when the generator is up and running. A low level of oil is indicated with the help of an indicator lamp on the front panel and the generator automatically shuts down in that condition to avoid any kind of damage. The windings for the alternator are made of copper and the brush is of a good design. The generator also has a built in automatic voltage regulator system. With these factors in place, the generator is designed to produce maximum steady power for a long period without any problems whatsoever. The fuel tank of this gas generator is fitted with a gauge that indicates the amount of fuel at any point of time. The DuroMax XP10000E has many power outlet points including two 120V, 20A 3-pin sockets, one 120V/240V, 30 A locking plug, one 120V, 30A locking plug, one 120V / 240V, and a 50A outlet socket. The power socket points come fully protected. The generator is equipped with circuit breakers, power outlets, fuel level indicator, low oil level indicator and automatic shutdown facility, heavy duty frame, volt meter, wheel mounts, etc. The 8000 W output is enough to supply the entire power needs of a house. It is also easy to assemble the generator. The XP10000E generator is balanced and stable. The wheel kit is also easy to set up and the tires are tough and are always inflated. Starting the generator is easy, all you have to do is pull the choke and just turn a key. With a noise output of 72 decibels it may seem noisy, but not when you are considering the large power output. For a power of 8000 watt, it is not so noisy after all. Perhaps it is only as noisy as some of the other 5 KW generators in the market. Some neighbors can choose to get disturbed with this noise, however. Before I bought DuroMax XP10000E, I did my research online and found that there have been some reports on bad after sales service. The complaints were about unattended telephone calls and lack of proper service by Max Tools. However, there was positive feedback too on satisfying customer service experience. On the whole, for a product that costs under $1000 and the features that are built in, the DuroMax XP10000E offers great value for money. There are other generators that are priced just about the same but do not have the power output of this one. If you are looking for a portable gas generator which can churn out 10000 watt of power, click on the button on the right to order the XP10000E from Amazon.com right now.